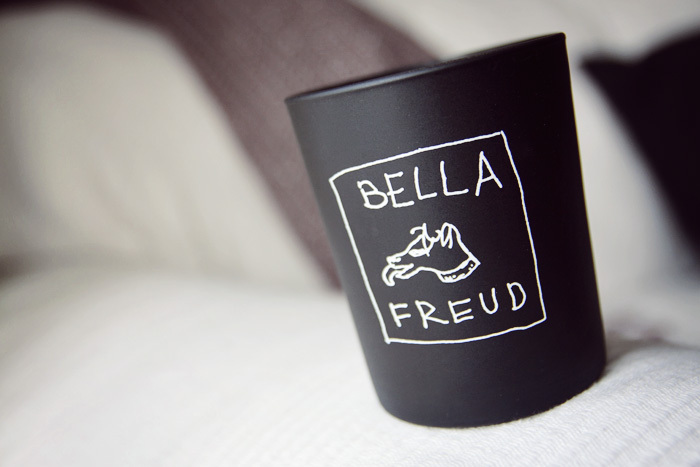 British Fashion Designer, Bella Freud has taken a tentative step into the world of beauty with the launch of three candles, currently being sold exclusively at SpaceNK. You may know of Bella’s work, via her army of celebrity fans who adore her playful slogans and signature caricatures or via her many collaborations with brands such as Christian Louboutin, Miss Selfridge and Biba. The three candles in the collection marry Bella’s love of fashion with this new venture into the world of fragrancing by continuing her theme of working with simplistic, eye-catching designs. One features the iconic “Ginsberg is God” slogan, the second is adorned with her “Je t’aime Jane” reference to Jane Birkin and Serge Gainsbourg’s love affair, and the third and final candle displays her celebrated brand logo, complete with one very waggy tongue! For this collection, I was pleased to hear that Bella Freud had teamed up with parfumeur Azzi Glasser of Agent Provocateur and Illamasqua fame. If anyone could help guide a novice into crafting a great, individual smell – she’s the lady for the job. I’ve been enjoying the rich, sensual, and downright exotic fragrance of her Incense Wood & Oud Candle, inspired by Bella’s first memories of a childhood in Morocco. The scent offers a gentle incarnation of smoked incense, cedar wood, resinous amber, and myrrh. It’s a little spicy but never peppery, calming and extremely well-rounded with a dry, smoky warmth and velvety aroma. Wondering about MAC's Wonder Woman Collection? A little TKMaxx splurge on random goodies! Get your NYX fix in Next!